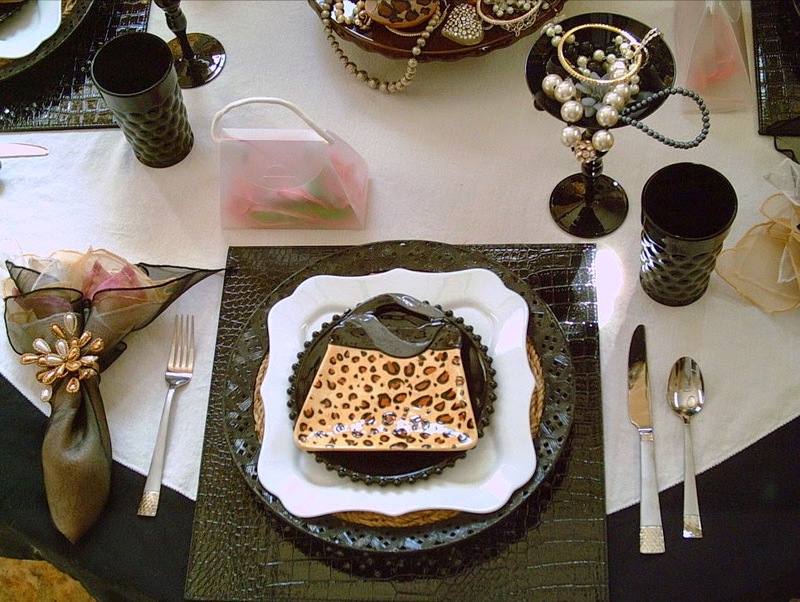 Cuisine Kathleen is hosting a Girl's Night Out Tablescape Challenge for the 29th of this month. Kind of a fun and exciting theme, don't you think? girl's night out. But... sometimes your ideas take a different course. I pulled out one item for my table, then another and another. Everything headed in a different direction. I have done a lot of tables in a more whimsical style, BUT I am not a one trick pony. 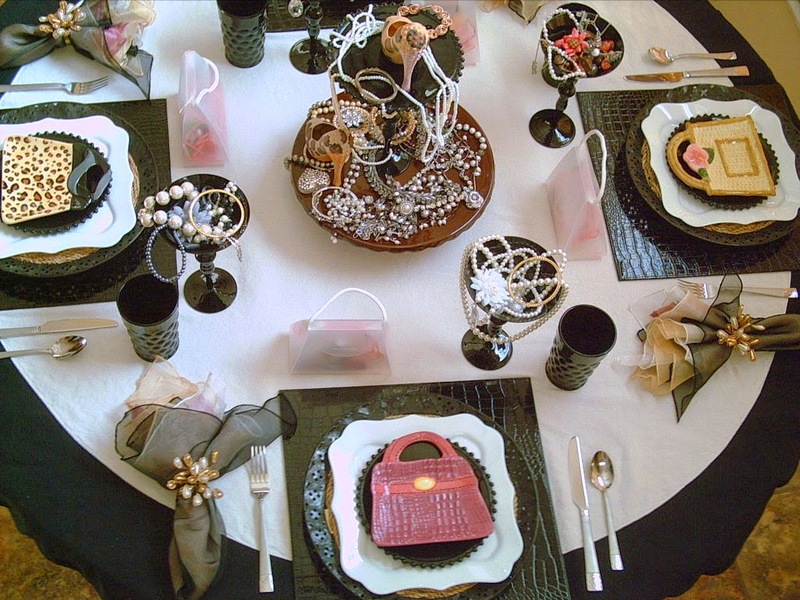 This tablescape is definately a more modern approach. I really love and appreciate all styles of decorating. I love it all! It's all about shoes, handbags, and Bling! 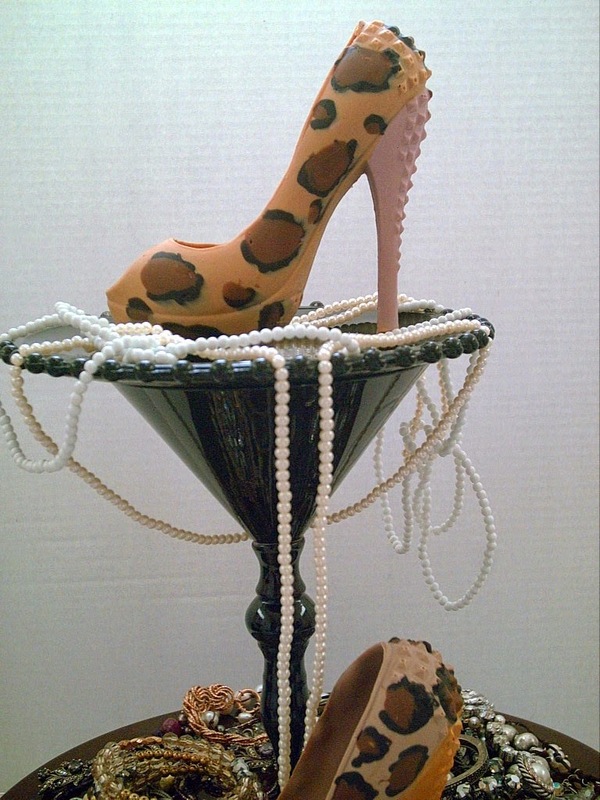 This centerpiece was designed around the BEAUTIFUL Chocolate shoes> Made for me by The Truffle Cottage. Not only beautiful but their chocolate creations are sublime in taste. 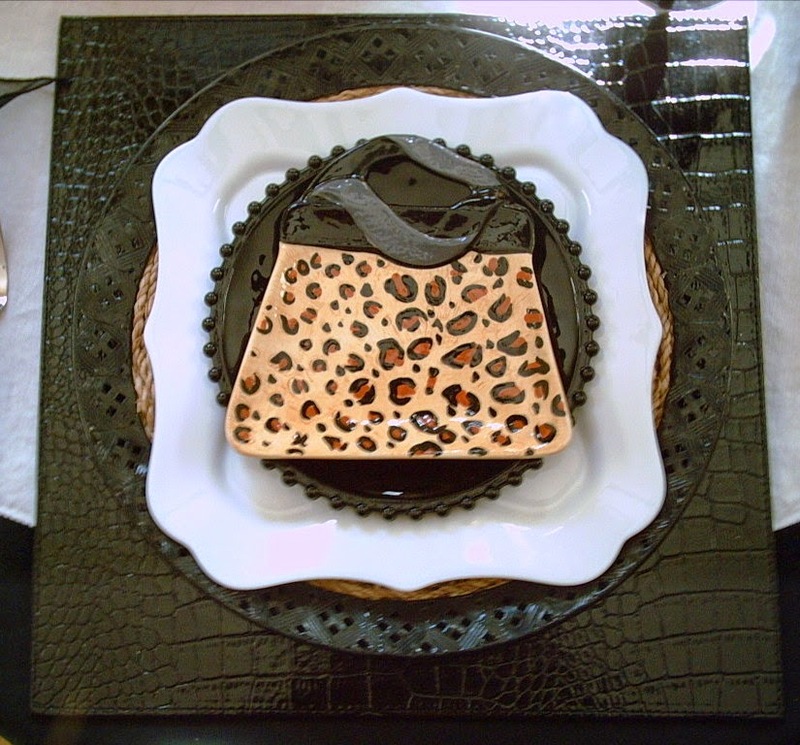 My inspiration was not only shoes but these adorable handbag plates from Boston Warehouse. 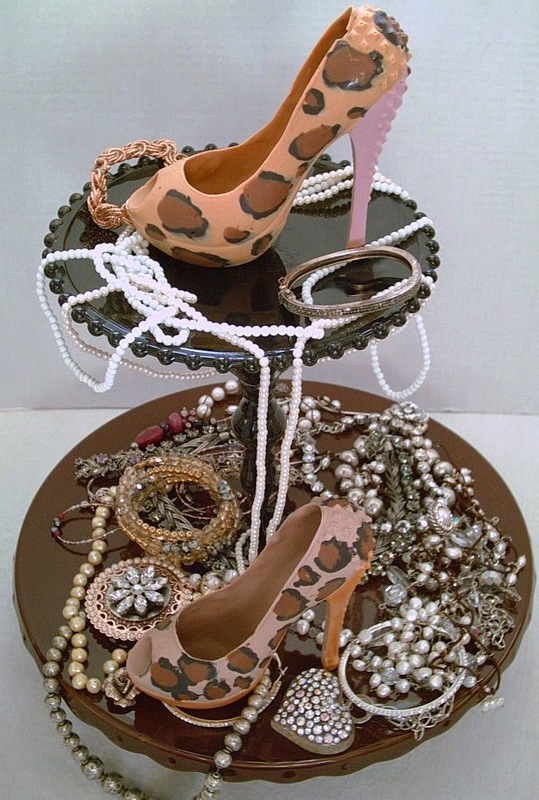 I love the leopard print on the shoes with either a touch of pink or gold on the heel. They match the plates so well. 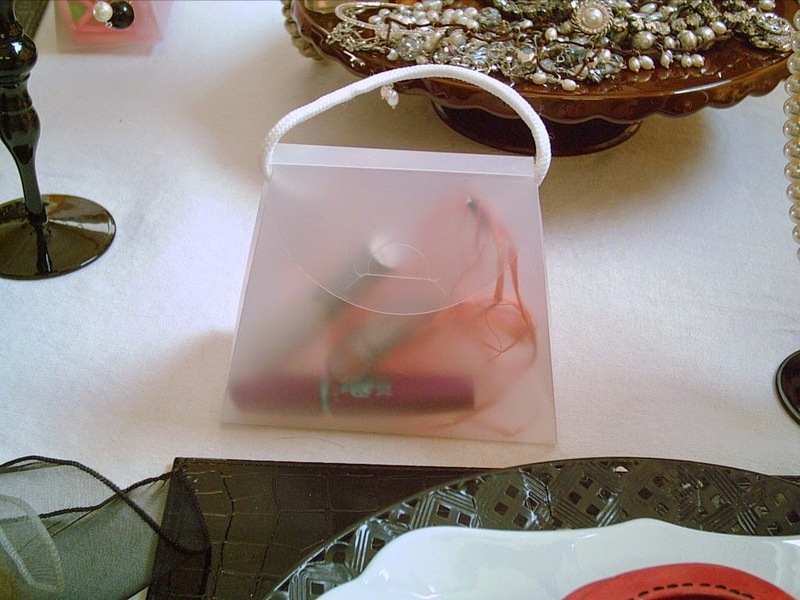 Each girl will get a take-home party favor of this cute white opaque purse filled with beauty products. 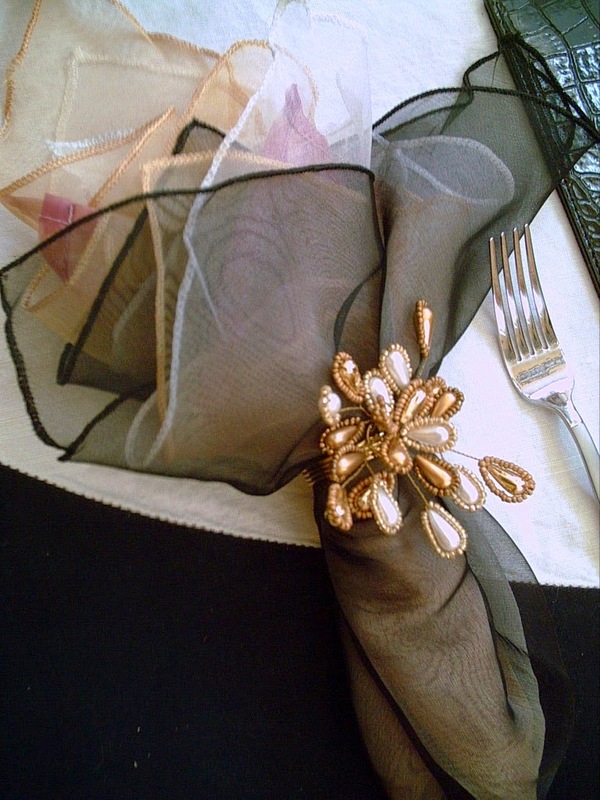 The napkin and napkin rings have all the colors that are used in this tablescape. 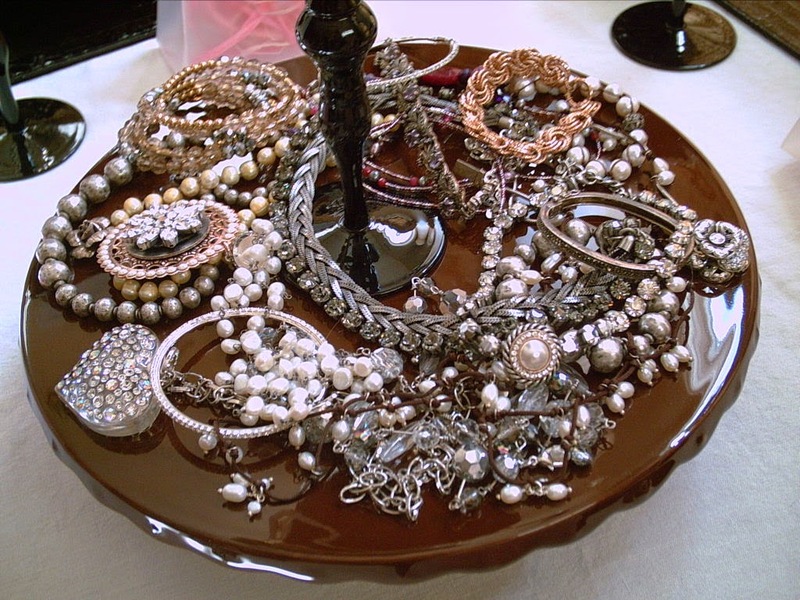 Everyone has brought some of their costume jewelry to play with or maybe exchange? at Between Naps on the Porch Tablescape Thursday. 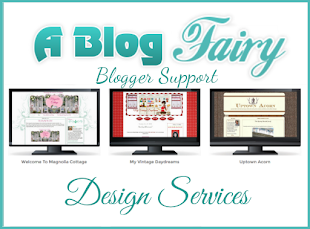 Hope you enjoyed looking at my latest Blog Post. Please leave a comment, they make my day! 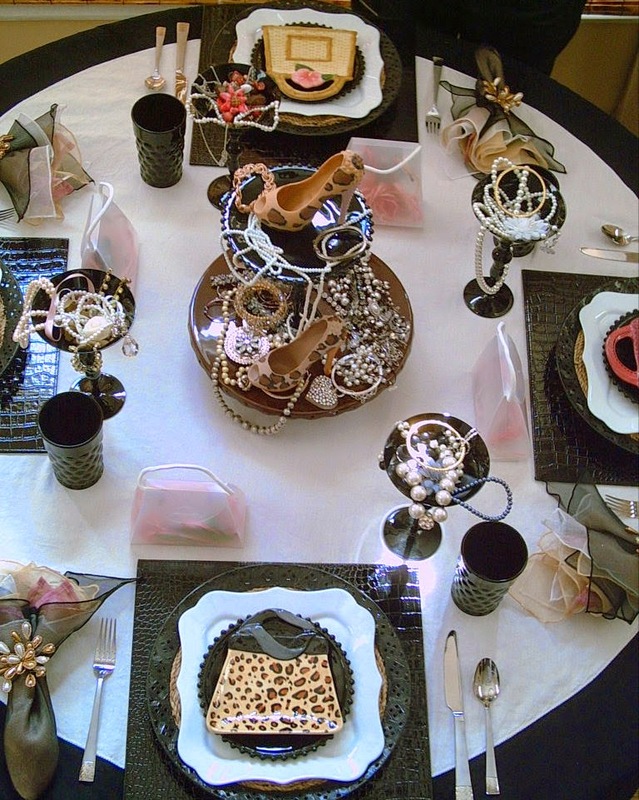 Just love your creative table and all the jewelry. 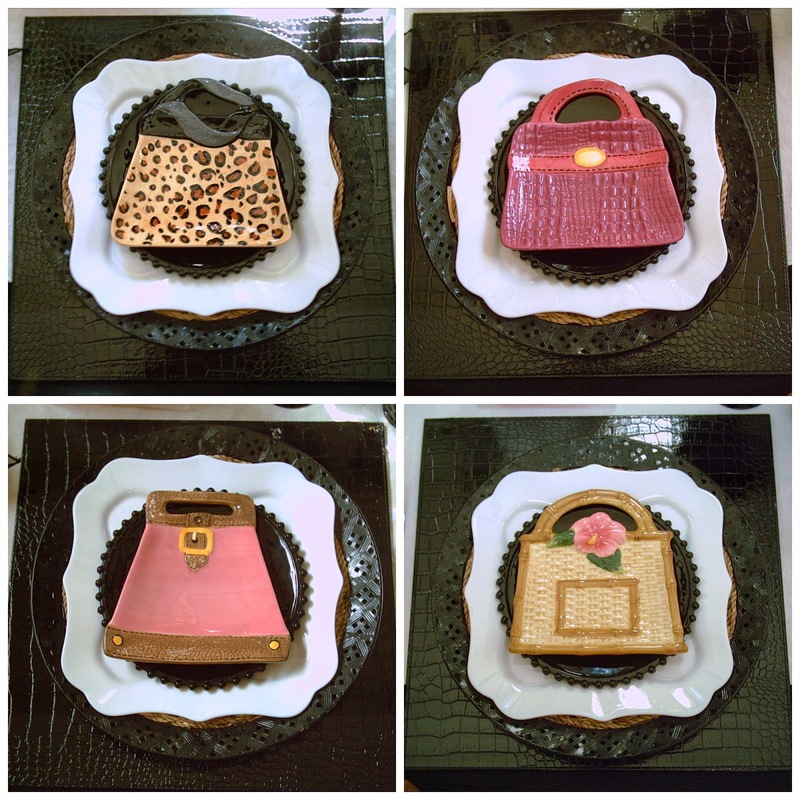 The handbag plates are sweet and who wouldn't love those chocolate high heels! This was a fun challenge. What a fun table, Valerie....and those chocolate shoes! So much fun! I love that you have a little 'purse' for each guest, what a hostess! LOVE it Valerie! 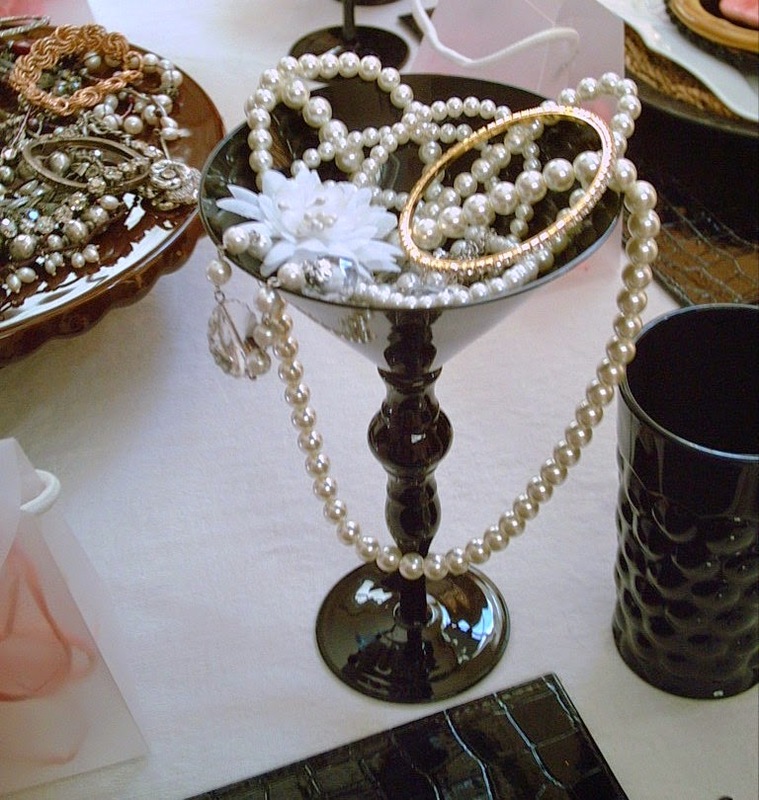 Nothing says Girls Nite out better than high heels and bling! The handbag plates are adorable! are the bomb! Any woman would sitting at this fun and gorgeous table. What a great idea! 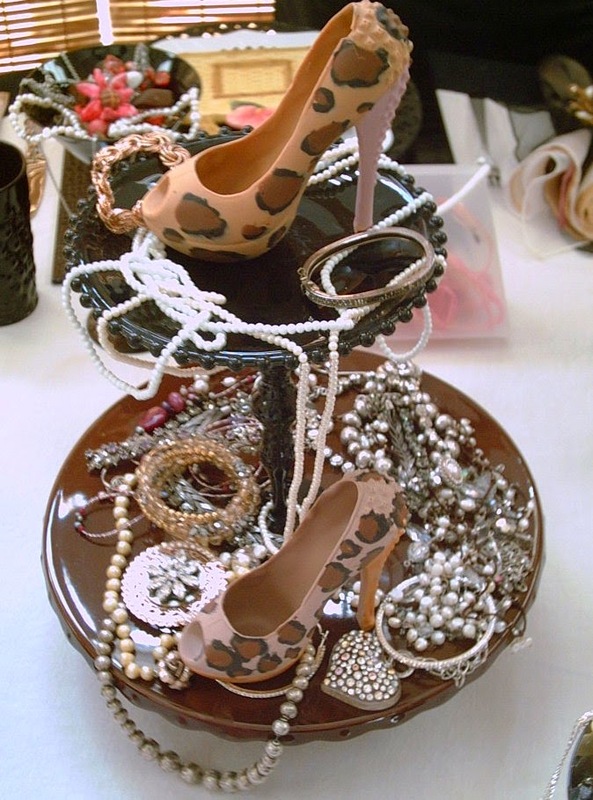 Love the purse plates, the shoes, and the bling...perfect for the girls. Valarie, this table is gorgeous! 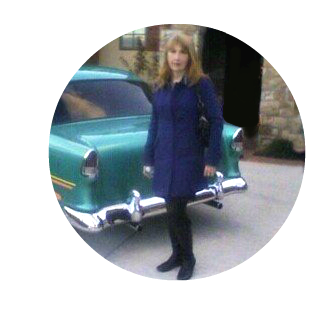 It has a classy elegance that makes me want to don my white pearls and little black dress and run over to sip some champagne before we leave for the opera or maybe the ballet. What fun that would be. The pocket book plates are oh so clever and the chocolate high heels are the rocket over the moon. Great job!!! OH, I wish I could have been a guest at this table, it is fabulous! 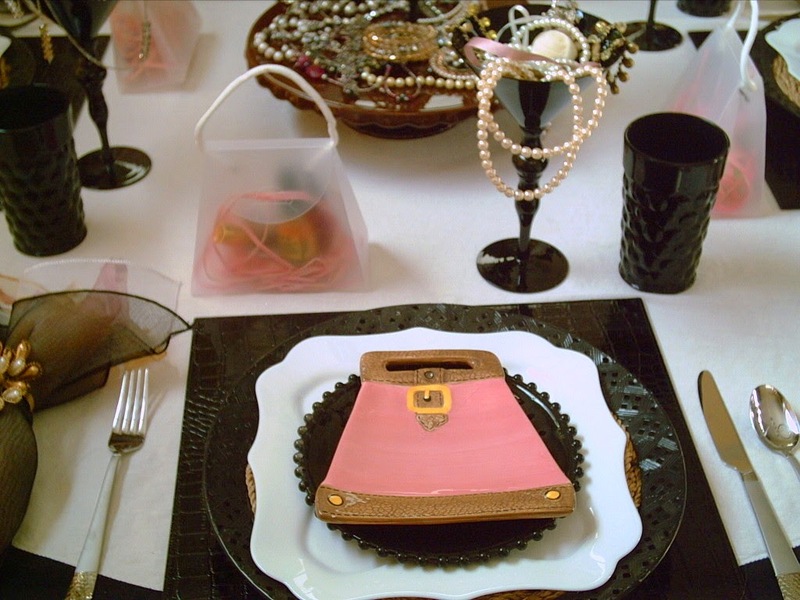 Love the purse plates and those chocolate shoes are amazing! I have never seen something like that!!!! Adorable, I bet it was a fun night!!!! Thanks, too, for your visit!! OMG!!! I'm sooo loving this tablescape! I'm having a few girls over for our monthly book-club meeting and will have to borrow some of your ideas!!! I'm so applauding you now! can you hear it! 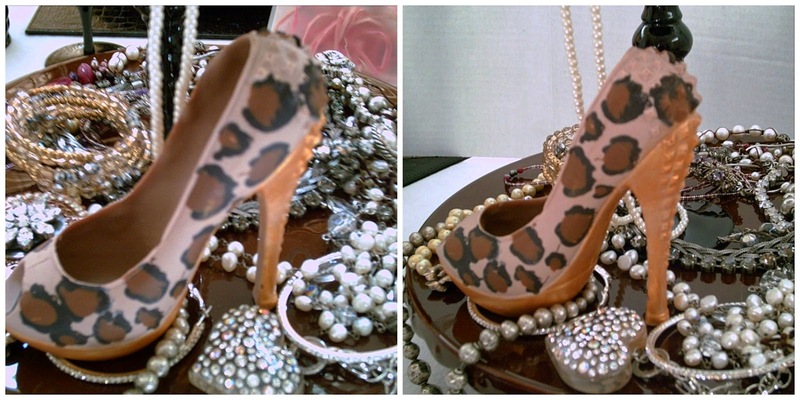 Those chocolate heels look too pretty to eat! (But who would resist for too long? ;-)) I love the costume jewelry and all those pretty necklaces. What a fun girl's night! Hey, Lady, you definitely hit the mark on this one!! What a great theme for a "Ladies Night Out." Your table and that centerpiece are perfect! I didn't get my act together in time to link up to Kathleen's challenge. Hopefully I will make the next one. I'm sorry I just here to visit you, but we had some family happy things going on and I'm finally getting to everyone. I'm so glad I'm not missing your fabulous, fun, beautiful and unique tablescape for Girls Night out. The plates and chocolate heels are awesome! FABULOUS, FABULOUS!!! I'm crazy about this table my friend.